We have been asked on numerous occasions if we could run a poll to see which figurines people would like as part of the range. With the collection extended to 180 now seems an ideal time. We have split the lists into Doctors because of the vast selection on offer. 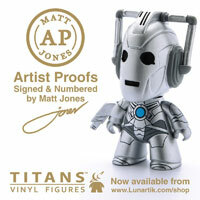 You can vote for up to 5 figurines per Doctor. The aim is to find out the figures people Most want. 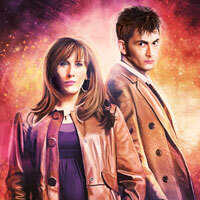 There is nothing for the 8th Doctor we can realistically include. No companions are included except a couple of specific variants and Kamelion. We can look at a companion poll if people want one. This extensive lists do include variants or story specific characters and monsters of already released figures. It also includes rumoured figures and figures that have more or less been confirmed but not officially announced. If we have missed any then apologies! With thanks to The Werewolf for taking the time to put the list together. This poll is unofficial but we will pass on the results. Which 3 Eaglemoss “Mega” Figures Would You Buy? 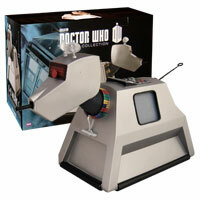 Which 5 Eaglemoss 2nd Doctor Era Figures Would You Most Want? 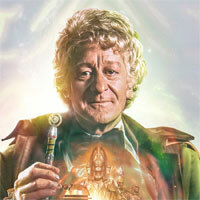 Which 5 Eaglemoss 3rd Doctor Era Figures Would You Most Want? Which 5 Eaglemoss 4th Doctor Era Figures Would You Most Want? Which 5 Eaglemoss 5th Doctor Era Figures Would You Most Want? Which 5 Eaglemoss 6th Doctor Era Figures Would You Most Want? Which 5 Eaglemoss 7th Doctor Era Figures Would You Most Want? 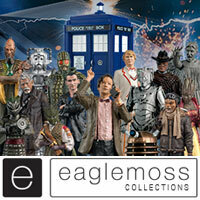 Which 5 Eaglemoss 9th Doctor Era Figures Would You Most Want? 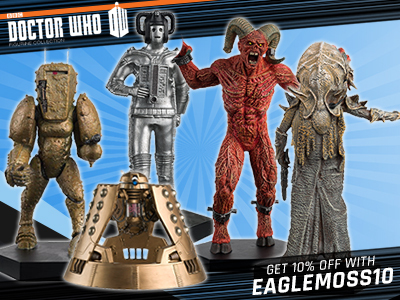 Which 5 Eaglemoss 10th Doctor Era Figures Would You Most Want? Which 5 Eaglemoss 11th Doctor Era Figures Would You Most Want? 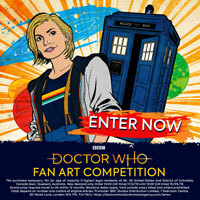 Which 5 Eaglemoss 12th Doctor Era Figures Would You Most Want? The Anne Droid, Davros in Tank, Asylum Daleks, The Watcher and Damaged Dalek Thay are all ones that must be done for me to die happy. I’m glad that the Chief Clown has a lot of popularity. He’s my favourite villain of all time from my favourite ever episode of Doctor Who. I asked Neil Corry about a possibility of this being a figurine on Twitter, and he agreed that it would be a good one for the collection and would want to do it. P.S- The werewolf from the Greatest Show in the Galaxy is called Mags and not Morgana, she is the fortune teller. Well, the Emojibot is confirmed now. That was the Yeti from Web of Fear. The one on the poll is for The Abominable Snowmen instead. 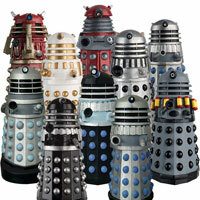 Apologies if this has been raised elsewhere, but is the glass Dalek from Revelation omitted because it would be impractical for Eaglemoss to create? It’s just a fan list, not everything was included. There’s no reason they couldn’t do it. CO had problems due to moving parts but that’s not the case here. Though not impossible, it would still be very difficult for eaglemoss to do according to Neil on twitter, however it was not deliberately omitted. Looks like someone felt sorry for it now. Probably yeah, seems everything has a vote now. isn’t the Wirn confirmed as a special? The Wiirn is semi-confirmed. It should be next special after War Machine, but there is a small possibility that they don’t go ahead (like with the Krynoid). In Dark Water, is the black-handled cyber variant a higher rank that the standard silver ones? There didn’t appear to be any clear rank in the story, but a variant is a variant. Thanks for this vote Booboo. By the way, the Varga Plant from Mission to the Unknown is showing for both the First and Sixth Doctors. Does anyone know what the next few issues will be after 114? Only 115 and 116. They are Auton (Spearhead from Space) and Pre Cyber Converion Patient respectively. Also 118 will be the Space Zombie from Oxygen. Particularly tricky picking just 5 from Tom Baker. That list in particular made me realise just how many great characters and creatures there are still waiting to be done. One of my personal wishes for 2018 is that we finally see a release from Season 16 (The Key To Time), there’s 2 or 3 that would make great additions (although Pirate Captain and Cessair aren’t faring quite as well yet as I would have thought; if they do Cessair I’d want her to be I her feather cloak and gold mask rather than humanoid / silver body paint form). Wait so is this an official poll and the most voted will get done or is this just for fun? If we have missed any them apologies! With thanks to The Werewolf for taking the time to put the list together. This poll is unofficial but we will pass on the results. Oh right. 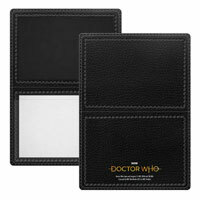 Also worth pointing out the ninth doctor one is broken. You can vote for more than 5 in that one. good choice that one. Go to move 100. Very pleased to see that. Toymaker is definitely one of my own ‘most wanted’. Also allows them to do a mag article based around the time they nearly changed the lead actor for the first time, I.e. this one has quite an interesting behind-the-scenes story to tell. Too much choice and only 5 to choose of each. the top of the polls were as predictable as ever. i hope it doesnt influence the makers too much. You forgot the gundan robot. Well, I was bound to forget something, sorry about that if you wanted to vote for it. I,m just simply saying its so difficult to choose from each category. I still champion a lot of the lesser desired monsters. Even if they are remembered for the wrong reasons. thanks for the poll werewolf, though how we haven,t had a wisher davros and classic zygon and ice warrior, thats something of an oversight. Unless there saving these until later in the run. Its only with the poll we get a sense of the most obvious figurines wanted. Generally more excited about the classic options, but keep them coming! I would skip The Nucleus, you can get a 12 pack in the fish section in Sainsburys. After my Thornton’s Chocolate Aggedor arrived two days ago, I am now increasingly anti-specials. After the brilliant Yeti, this one is so wrong. A War Machine, Krynoid, Kroll, Mara, Myrka, Drathro and even Cleaner, a far more warranted. Glad you skipped the “Brain” from Time and the Rani, but a design I have always loved is the L3 Robot from Mysterious (at least we all have part of one in our showers). I recently bought a pewter miniatures of the L3 robot. It’d be a great gateway into the Companions. I mean, it’s getting to the point that the Range has been extended so much that it makes sense for them to start introducing companions to the range, so making versions of them that are possessed by aliens and so on would be a good way to test the water and see how well companions would sell. 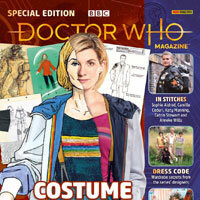 I know that the most popular companions would sell easily, like Rose, Sarah Jane, Jack, Donna, Amy, River, Clara and probably even Bill at this. I’m not sure how well others would sell in this particular market though, I can’t see Polly or Mel being massive sellers (though I’d personally love figurines of them both). can’t understand why anyone would wast a vote on figurines confirmed (Missy) Anthony Ainley? All masters are virtually a forgone conclusion except for movie version, that is a sticky one. many voters probably wont even know “what’s on the list” or what’s almost confirmed, not everyone follows all gossip. The Roberts Master is “on the list” too, whether they actually get the go ahead or not is another matter entirely.